Observations and opinions essayed in pursuit of a sensibly cultured life. From the Theater Vault Dept. : Here’s a charming little musical that had its world premiere in Cohoes, NY, in 1989; it had runs in Chicago and Manhattan in the years that followed. I’m going to give you my review first, followed by an interview piece that ran a week earlier. 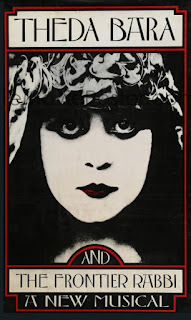 “IT'S LIKE A MOVIE,” sings Rachel, a screen-struck character in Theda Bara and the Frontier Rabbi. And she's absolutely right. This musical, receiving its world premiere at the Cohoes Music Hall, boasts an improbable plot, unbelievable sets, wildly uncharacteristic songs and a gratuitous helping of beautiful women offering generous views of their bosoms. I'm going to see it again as soon as I can. The creators, composer Bob Johnston and writer Jeff Hochhauser, call their show a “shameless musical,” and shameless it is in exploiting every entertainment style that's ever been overmagnified on the silver screen. 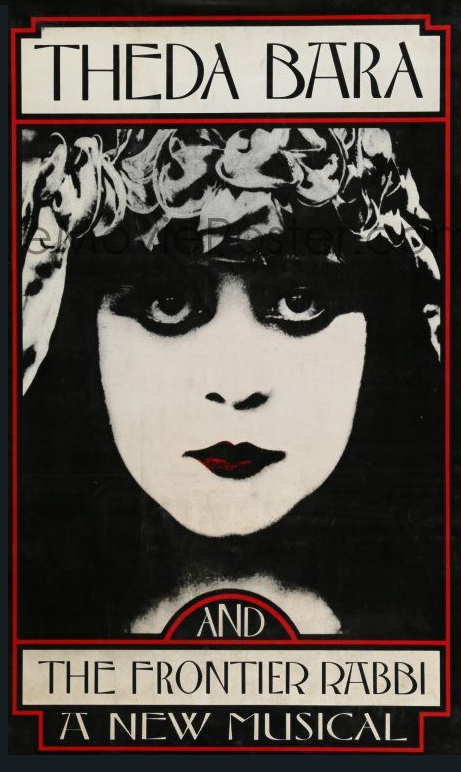 Set in 1917 at the height of Theda Bara's stardom, it opens with the glamorous vamp at her most austere and inaccessible, just as publicist Selwyn Farp (Raymond Wood) designed her. The gorgeous Theda, played in varying states of dress by pretty Liz Larsen, is regarded as such an evil influence that no self-respecting person would be caught watching her films. That's the problem a young rabbi goes up against when a member of his temple catches him at the movies. Isaac Birnbaum is so flustered that he explains his purpose as information-gathering: he's going to deliver a sermon against the vile woman. From the Vault Dept. : Thirty years ago, the Albany (NY) Symphony offered a splendid performance of Mahler’s Fourth, one of the more accessible of that composer’s mighty works. These were the glory days of Geoffrey Simon’s association with the orchestra; the Australian-born conductor was the ASO’s music director for four years. He helped lead a festival of Australian music, of which component concerts are reviewed here and here. MAHLER’S SYMPHONY NO. 4 is a conductor’s paradise. It’s the musical equivalent of painting a fine and detailed figure study, the combinations of instruments providing an exotic palette of colors. Albany Symphony Orchestra music director Geoffrey Simon gave the orchestra one of its best showings yet Friday night at the Troy Music Hall when he led them through this work. It was a thinking man’s Mahler, extruding passion from a considered plan. 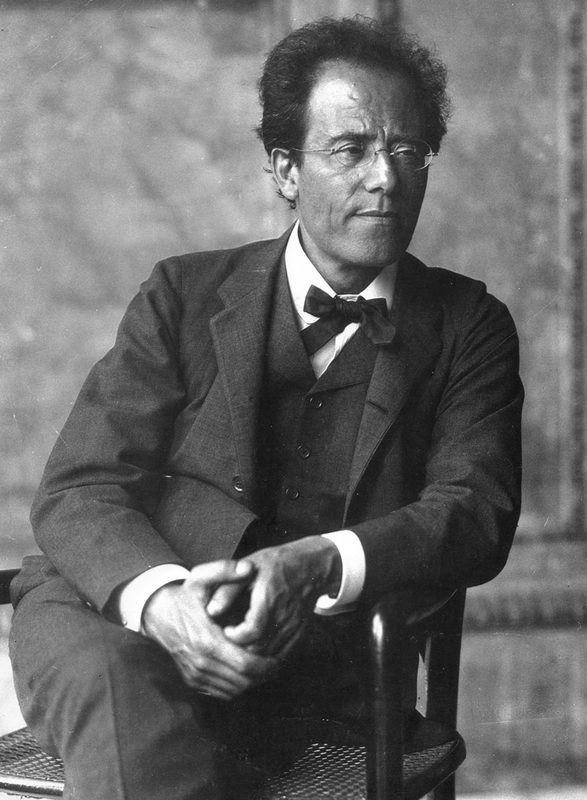 Mahler was a symphonic dramatist: his works have plots, characters, confrontations. Simon understands this construction and is as much director as conductor. And, of course, there was the setting of settings in the Troy Music Hall, an edifice dating from the age of symphonic excess that Mahler brought to a zenith. The walls filled the soft sighs of the slow third movement with warmth; likewise, the terrible outbursts were given that extra flare of life. We’ve been witnessing the steady growth of the ASO’s violins into a sections with cohesive, characteristic sounds; this symphony gave the cellos and basses a chance to show their stuff and it further confirmed the artistic development of the orchestra. AS A CHILD, Jinah Kim’s favorite dish was pan-fried yellow croaker. 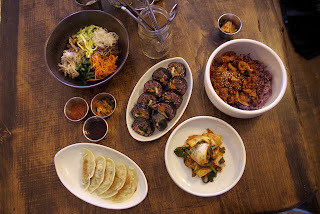 When her mother would prepare it for the family, it reaffirmed their Korean roots. The family had moved from Inchon, South Korea, to Framingham, Massachusetts, when Jinah was three. Other family members had a jewelry store there, which probably kindled Jinah’s entrepreneurial spirit. But there were more moves to come: to Chicago in 1998, where her father could work as a pastor, and then to Troy, NY, in 2001, where he founded a church and also started a jewelry shop nearby. “I was 12,” Jinah explained, “so I was very sensitive to – everything.” She was speaking at Hudson Valley Community College in Troy, New York, on February 21, at a talk titled A Place at the Table. It was part of the college’s Voices lecture series, which seeks to stimulate community awareness and discussion, a mission Kim fulfills with passionate dedication. Guest Blogger Dept. : Do movies pander to the masses? 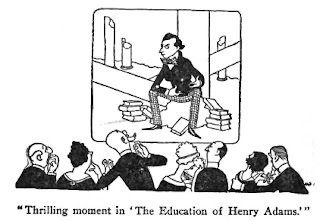 Nearly a century ago, Robert Benchley argued the point in this 1920 Vanity Fair piece. The Scientific Scenario: A Film Version of The Education of Henry Adams for Culture’s Sake. SOONER OR LATER some one is going to come out and say that the movies are too low-brow. I can just see it coming. Maybe some one has said it already, without its having been brought to my attention, as I have been very busy for the past two weeks on my yearly accounts (my accounts for the year 1920, I mean. What with one thing and another, I am a bit behind in my budget system). And whenever this denouncement of the movies takes place, the first thing that is going to be specifically criticized is the type of story which is now utilized for scenarios. How can a nation hope to inject any culture in the minds of its people if it feeds them with moving-picture stories dealing with elemental emotions like love, hate, and a passion for evening-dress? Scenarios to-day have no cultural background. That's the trouble with them. They have no cultural background. Now, if we are to make the movies count for anything in the mental development of our people, we must build them of sterner stuff. We must make them from stories and books which are of the mind rather than of the body. The action should be cerebral, rather than physical, and instead of thrilling at the sight of two horsemen galloping along a cliff, we should be given the opportunity of seeing two opposing minds doing a rough-and-tumble on the edge of a nice problem in Dialectics or Metaphysics. SOMETIMES YOU NEED NO WORDS to make a convincing argument. 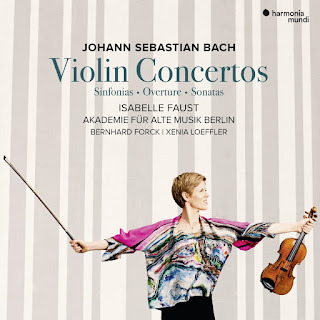 Listen to violinist Isabelle Faust dance through the difficult bariolage passages in Bach’s Concerto in D Minor, and you will be convinced, as I am, that this piece originally was written for the fiddle, and not for a keyboard. It’s known today as a keyboard concerto because the only authentic manuscript comes from a collection the composer made of seven keyboard concertos, all of them thought to be recycling material from earlier works. There remain doubts, because Bach scholars are aggressively opinionated, but not only do I say that Faust’s interpretation of this work is authentication enough – I’m also prepared to give the keyboard crowd permanent ownership of the concerto in F Major, BWV 1057, which is better known as the Brandenburg Concerto No. 4, in which guise it’s a violin assuming the keyboard’s role. But I find the keyboard to be more idiomatic. Which shouldn’t be surprising. Bach knew his way around the keyboard, be it harpsichord or organ, and could write as idiomatically for those instruments as he could for the violin, as a player of which he also excelled. But it’s not just the keyboard repertory that Faust is plundering in this new two-CD collection: she also takes aim at the flute, seizing as she does the Orchestral Suite No. 2, BWV 1067. The flute-solo version is in B Minor, but Bach authority Joshua Rifkin maintains that an earlier version in A Minor featured the violin, and Faust’s performance does nothing but support that notion with an engaging, danceable approach that meshes perfectly with the original-instruments approach of her accompanying ensemble, Akademie für Alte Musik Berlin, conducted by concertmaster Bernhard Forck. FORTY-FIVE YEARS AGO TODAY, when the First of March also fell on a Friday, seven aides and advisors to Richard Nixon were indicted by Judge John Sirica for their roles in the Watergate imbroglio -- and Nixon was named an unindicted co-conspirator. Let's celebrate. 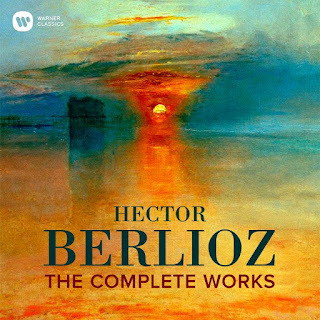 ONE OF THE MOST SURPRISING DISCOVERIES lurking in a trip through the complete works of Hector Berlioz is the sense of intimacy that peeks through. Here’s a composer who demanded extra-large orchestral forces, and whose music surges with the grandest of gestures, yet in and among those roarings are moments of incredible delicacy, rendered all the more delicate by the context in which we find them. Thus, as the “Sanctus” in Berlioz’s Requiem comes to us an hour into the piece (after the tumult of a terrifying “Rex tremendae” and a big-boned “Hostias”), a solo tenor soars above quiet strings – here it’s the welcome voice of Robert Tear – in a passage that seems worlds apart from what came before, but it’s precisely because of the moods and momentum that brought us here that we’re so moved by the moment (in this respect, it’s not unlike the “Sanctus” in Beethoven’s Missa Solemnis). 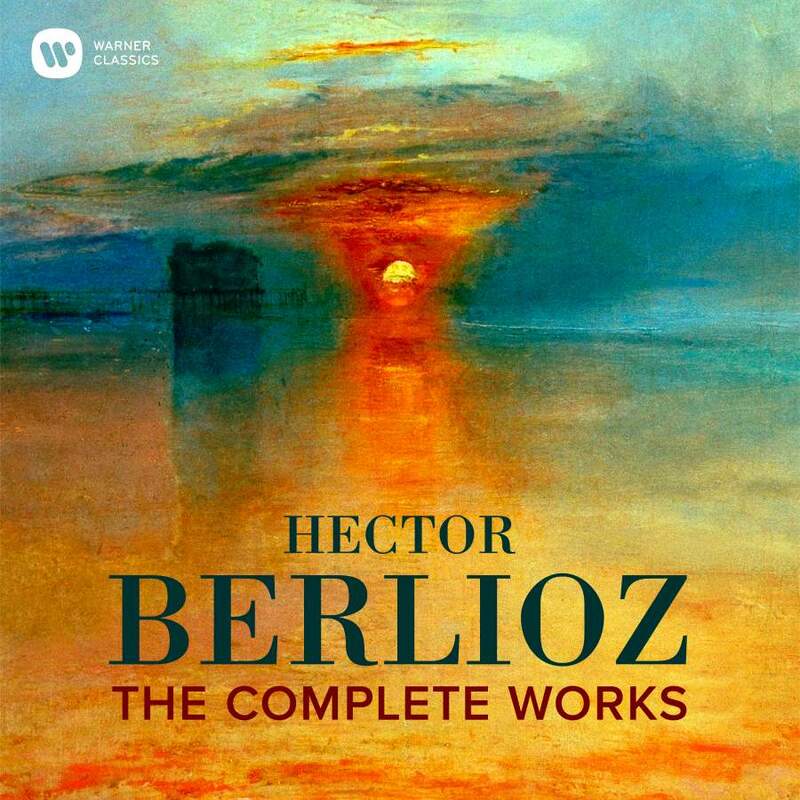 We celebrate Berlioz in 2019 – March 8 being the 150th anniversary of his death – and Warner Classics has produced a 27-CD of the composer’s complete works to honor the occasion. The aforementioned Requiem is the formerly out-of-print version recorded in 1975 by the City of Birmingham Symphony Orchestra conducted by Louis Fremaux, a stirring performance that holds its own against the legendary alternatives helmed by Colin Davis and Charles Munch. ... works as a writer, actor, singer, sound designer, photographer, chef, and much, much more. See more at banilsson.com.